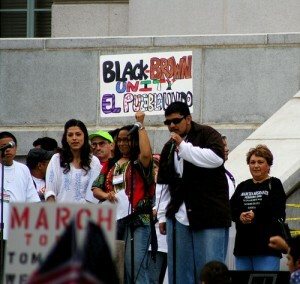 The previous post discussed the idea of unity between Blacks and Latinos/as. As stated before, there are several reasons why Blacks and Latinos/as should get along on paper. However, for every perceived similarity between two groups, there are certainly reasons why groups may disagree and/or even collide in terms of supporting each other. One reason blacks and Latinos have failed to form an alliance is philosophical. The black civil-rights struggle, in the South at least, was mostly about asserting legal rights and demolishing barriers to voting by those who were, in theory, already enfranchised. The Latino struggle is quite different. Its goal is often the selective or non-enforcement of the law, particularly on immigration. A common demand, for example, is for local police not to co-operate with federal immigration agents. And, whereas blacks in the 1960s demanded power in proportion to their numbers as adult citizens, Hispanics want rather more. Considering that unemployment for minorities, especially Blacks and Latinos/as is higher than the national average right now, it is easy for one to see how employment can divide two groups. With a stable job, families lose out on important opportunities. Without access to opportunities, good health, food, clothing, housing, etc, the disparity gap increases in the United States and leaves many in a painful predicament. Click the link below to read more about how the Unemployment crisis affects relations between Blacks and Latinos/as.